Moon Bingo won’t give you the chance to win enough money to take one of the pre-bookable flights to the moon but they do offer plenty of free bingo in at their new look internet bingo site. Previously part of a big network, Moon Bingo have made the move to standalone, one that had been planned for quite some time before it actually happened. Still using the same great bingo software Moon Bingo will definitely be one of the new look bingo sites to keep an eye on. 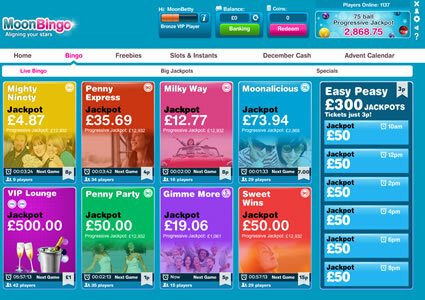 Moon Bingo has a fresh and exciting look which compliments the site name very well. Offering great jackpot games, free bingo and bargain games, it is easy for any player to see the benefit of moving away from network and re launching as a stand alone site. 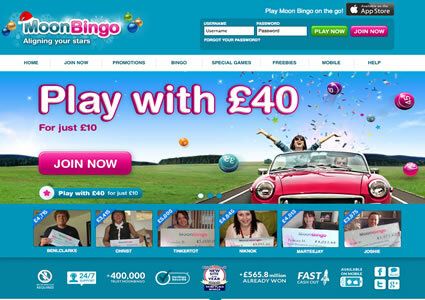 However, whilst the brand may now be standalone, it is also part of the United Bingo network so often has ‘linked’ promotions with other brands from the group. To get the cheapest bingo tickets you might need to travel to the moon, well at least Moon Bingo, as the site offers all new players exclusive access to a free bingo room played with the classic 90 ball variable and named ‘Free for Newbie’s’. You will be eligible to enter this room for two days only after registration and you can find it under the ‘Free’ tab in the lobby. However the motto does seem to be ‘funded players have more fun’ and it’s easy to see why with the great guaranteed jackpots on offer including the monthly game playing for a staggering £1 million! Although you were originally asked for your financial details during the registration process this is no longer requested so you can register and play the free bingo games that are available for everyone to play regardless of whether you have funded your account or not. There are a multitude of bingo rooms available at Moon Bingo with a selection of both 75 and 90 ball bingo available. In addition, the site boasts a wide variety of bingo side games for players who love a little spin of the reels or a game of video poker alongside their internet bingo game. Moon Bingo offers both 75 ball bingo and 90 ball bingo and in both rooms you have the option to either manually or auto dab your bingo cards, have your best card showing first and turn the bingo callers voice on or off. You can also turn on or off the tool tips, the animations and the themes as well as customise your settings for the price alerts. For pay to play bingo there are numerous bingo rooms. Each room hosts a different bingo game and dependant on ticket prices for the game, the maximum number of tickets can vary. You can easily find a game with ticket prices to suit your budget by clicking on the appropriate tab in the bingo lobby. You will find there is a tab for free bingo, games costing 1p + and another for 10p + games and when you open these tab you will find a selection of rooms to choose from with various opening times. Plus they have even got a Swedish style bingo room that you can explore and with five chances to win; who wouldn’t? You best bet is to check out their promotions page for all exclusive jackpots and special bonus games; Moon Bingo really know how to play a bargain and if you join in with their ‘In for a Penny’ jackpot game, you’ll know why – a £400 prize pot up for grabs for penny bingo tickets. There is an abundance of free bingo on offer at Moon Bingo and it shouldn’t be very difficult to find a free bingo game at any point during the day. However, although free bingo is free, some of the room will only allow funded players to play the free bingo games, so if you are not looking to deposit then free bingo may not be as frequently available. 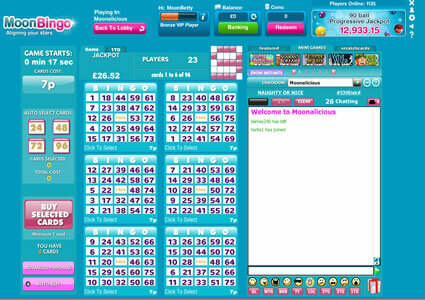 This site is home to the Self Made Millionaire Jackpot game that plays once a month for £1 million. Like all coverall bingo jackpots the big prize can be won by calling bingo in a certain number of calls, after that the jackpot decreases but someone will win at least £1,000! Tickets cost 25p each and the game will commence on the 3rd Thursday of every month. Payday Bingo, which gives you the chance to win up to £10,000, takes place on the last Friday of every month and offers a guaranteed jackpot of £2,000 for just 30p per ticket. Keep your eye out for those generous progressive jackpots too as you never know who will be lucky enough to bag one of them. Great thing is Moon Bingo offer PJP in both of their 90 ball and 75 ball bingo rooms, these are called – Full Moon and Show Me the Money – so whichever takes your fancy, you’ll always be in with the chance of winning. Want to play bingo on the go? Moon Bingo is one of the many online brands now offering bingo for mobile phones, iPads, tablets and the like so no matter where you are you can always have a chance at playing your favourite bingo and slots style games. You can easily download this app on your phone (if it’s compatible) by tying their web address into your search engine or by scanning their QR code from your PC. Moon Bingo hosts a wide array of bingo side games at their internet bingo site. There are instant win games, three reel slots, multi lines slots, superslots, table games and scratch cards all available to choose from either in the bingo lobby or in the bingo room above you chat screen.